What is iterative code review? Iterative code review refers to the situation when a single piece of work is reviewed more than once by the same reviewer. In fact this is a regular case. None of major changes in code will pass without reviewers comments. They find bugs and faults which an author should fix, and then show the code over again. The Review Assistant documentation contains more detailed description of the iterative code review. Not all code review tools support repetitive code inspections within a single review. Review Assistant has been providing this feature since the first release. In Review Assistant 2.0 we have significantly improved this process. Here’s how the review looks after several iterations. Now let’s consider the innovations in the code review process in more detail. The most important innovation is that a reviewer can track the files they have already reviewed. Previously a user had to keep this information in mind. If the list of files in a review is too long, it is easy to lose track of what has and what has not been reviewed. The total number of unread files is shown (3 unread files in the picture). All unread files are shown in bold. In the picture above we can see that the author has fixed existing comments, and added a new revision for re-review. The double slider control above the file list shows the revisions range added to the current review. Slider’s notches allow you to determine an iteration’s number. As we can see, this is the fifth iteration. The file list will be filtered to display only those files that were changed during the last iteration. In case the reviewer compares files, they will see only changes made during the last revisions. It often happens that the author adds wrong revisions to a review, or frequently leaves out of account the correct ones. In the previous versions of Review Assistant it was impossible to correct this selection mistake after saving a review. If the problem was detected right after a review creation, the only solution was to delete the review, and add a new one. But if such mistake took place in the second or third iteration — it was a real problem. 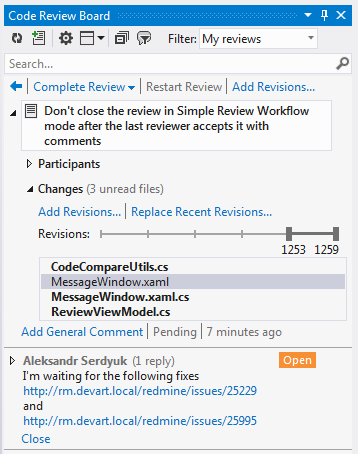 In the new version of Review Assistant we have added the possibility to change revisions that are added in the last iterations.